So, Startup Weekend is rapidly approaching, and you're on the fence about coming. Perhaps you're unsure about walking in on Friday, not knowing anyone. Maybe it's the worry that you don't have a ground-breaking idea to pitch. Or possibly it's the opposite - you're scared you'll lose your original idea to the crowd. Firstly, if you're coming alone, be assured that you will not be the only one. The aim of the event is to allow people to bring along ideas or skills, and team up naturally where the needs and interests match. Walking in, you'll find yourself in a room full of people with the exact same idea in mind. On Friday evening, pitching is only part of the schedule, with lots of time to meet other attendees and settle in. As long as you come along with a willingness to make something happen, you'll be fine. Apart from that, what else should you bring? We're not too fussy really. Whether you're preparing a pitch or not, we want to see you there. After the weekend's pitches are selected (which will be done by all the attendees, not the panel of judges), each pitch will need a diverse team to help realise the idea. By the time the resulting startup is presented to the judges on Sunday, you'll have gained skills and experiences that wouldn't have occurred to you before, and you might even discover a talent in yourself that you never knew you had. 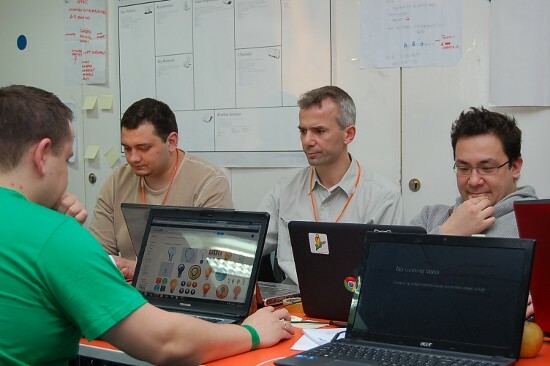 If you do come with a idea in mind, Startup Weekend is the perfect place to validate it. So don't be scared to step up and pitch it. There's very little to gain from holding it close to your chest - you could end up finding the ideal team to realise your vision, or getting some useful feedback from our mentors or judges that brings it closer to reality. The idea of "launching a startup in 54 hours" might be worrying some of you as well. Nobody expects you to be packing in the day job and devoting yourself to whatever comes of the weekend! Just over a third of startups continue more than three months after the event the began at. For many attendees, the Startup Weekend is about testing not only a startup idea, but the world of startups. The experience you take home, and the contacts you make may turn out to be the most valuable take away from the weekend, and that's just fine. A great example from the last Dublin Startup Weekend is Tracy Keogh. While she initially came along just to participate , she decided while watching the others to jump up and pitch her own idea. She ended up building a great team and worked on her Insurify app all weekend, and was presented with the "Best Pitch" award on Sunday for her efforts. She really took advantage of the freedom offered by the Startup Weekend formula, and it paid off. Another Dublin Startup Weekend alumnus, Russell Banks, is a prime example of what Startup Weekend can lead to. His team won the event with Prescience AI, which later evolved into Conker. Russell is now known for his curation of the Dublin Startup Digest, production of Dublin Beta, and has since founded Investor Sheet. The official ethos of the Startup Weekend is to provide attendees with an incredible networking and learning opportunity. The Galway organising team is fully committed to that, and we hope that our efforts will make your weekend productive, useful, and most of all, fun! Will you be the next big thing in #FoodTech ? What can you do in 54 hours?